Yes it is also slogan by Indian mobile operator AirTel. I choose this title for my blog, because I like it. It indicates my motivation for starting this blog. Yes, I want to express myself. I have already captured in my first blog, that this blog is not confined to any topic. All inclusive. Express with all dimensions. Logical and emotional. Art and science. Software and poem. Spiritual and scientific. Management and technical. Opposite values are complementary. Many people wonder, about website address. Layers 7. I like number 7. We have 7 sages. (Sapt Rishi). The rainbow has seven colors. Networking OSI model has seven layers. Our existence also has seven layers. Today I will write about them. We exist. What is the proof? Our physical gross body. We write, read blogs with our body. It has tendency to become horizontal. Lie down. Sleep. Rest. The same body helps us to achieve our goals when we work hard and smart. The corpse is also a body. It does not breath. 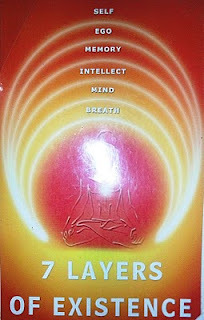 Yogis emphasize on breathing, Pranayama. It is also a source of energy. We have like and dislike. Desire. Mind. Mind always wander. Read "Music of Mind" to know more about them. We always judge. Good or bad. Right or wrong. Useful or useless. The almighty gifted us intelligence to judge good and bad company. However, this same intelligence contribute to build prejudice and sterotype. Memory was gifted to us, so we can learn from our experience and remember our strength in hard time. Sometime, we store negative and bitter memories. All these layers body, breath, mind, intelligence and memory give a unique identity to us. That forms ego.The positive ego is self-esteem. However, ego also creates boundary, separations, non-belonging. Behind all these six layers, you exist. Your core part. The self. Aatma. Spirit. Consciousness. Love. Peace. You are that. It is common between me and you. It is omnipresent. And let me express myself. Myself and yourself are same. Ourselves. So today, this blog is completing two years. The effort to express myself. However this self is not expressible. Life is an exercise to express the InExpressible. How? I will write sometime about it.